"Great players always want to go up against the best," his dad would say, "even if they don't win. A real rivalry is when teams or players go back and forth between who wins and loses so when they play each other, both are at their very best." It bothered Josh that he didn't relish the thought of a good rivalry. He just couldn't help wishing for the kind of games where they swamped the other team. That's how it had been in this qualifying tournament so far, but Josh knew that it wouldn't be true today. Josh LeBlanc, the twelve-year-old phenom from Tim Green's best-seller, Baseball Great, is back in a sequel which again combines a taut gameplay narrative with a mystery which shows the seamy underside of sports. After having suffered a potentially vision-threatening intentional beanball in the playoffs leading up to the tournament at Cooperstown, Josh LeBlanc is forced to decide between a forced hiatus from baseball while his occipital fracture heals or surgery that will leave a noticeable scar but make it safe for him to play in the Hall of Fame tourney. Josh and his dad and coach opt for the surgery over his mom's objections, and three weeks later, his sight and his desire to play are as strong as ever, especially when Josh overhears his parents' conversation that reveals that their financial security may be riding on this series. With his meatball sidekick Benjie Lido rooming with him and his sort-of girlfriend Jaden Niedermeyer along as sports reporter for their local newspaper, Josh keeps up his miraculous homerun-hitting pace through the opening rounds of the series. But in one of his games, Josh's Titans are up against an opposing pitcher who throws real heat--when he's not a bit wild. Josh can't help but notice that the umpire, a down-on-his-luck local named Seevers, is giving the pitcher an unfairly wide strike zone. Josh's suspicions are further aroused when he realizes that the ump seems to be tipping the bracket to make sure that the Titans will play the Comets in the final two, a team whose star pitcher, Mickey Mullen, Jr., is the mediagenic son of ex-Big Leaguer Mickey Mullen, now a celebrity movie leading man who seems determined to make sure his son follows in his footsteps to baseball glory. It doesn't help that Jaden appears to be intrigued with the good-looking young Mullen and seemingly enjoys the comforts of Mullen's limo and his first-name contact with such ESPN lights as Bob Costas. "I'm just doing research," she reassures Josh as she heads off with Mickey, but Josh can't help wondering if the the lure of celebrity journalism isn't coming between them. "Your dad's a sharp cookie," Benjie said. "Whatever's meant to be, right? We just let it happen and enjoy the whole thing. I love that." "No!" Josh said. "He's not right! Not about that. We can't just let it happen, Benjie. We've got to win this thing tomorrow, and I'm not talking about winning it just for us. I can't let Mickey Mullen think that he gets whatever he wants, like he's acting in some movie and we're all just a bunch of extras. We've got to win this thing." "We've got to win it for my dad." A bit of serious sleuthing in which Jaden and Benjie play a significant part, culminating in an exciting speedboat chase with Jaden crashing an ESPN event with her scoop, brings the book to its climax, the final game, in which the two teams and Josh and Mickey, Jr. face off in a fair contest. Author Green graciously gives the final heroics, not to Josh, whose bat of course keeps them in the contest up to the final inning, but to his chubby, wisecracking, and laid-back pal Benjie, who finally lives up to his self-proclaimed title as the "heavy hitter." 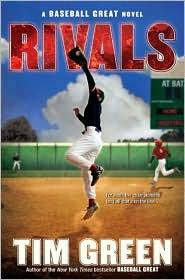 Tim Green's latest, Rivals: A Baseball Great Novel (HarperCollins, 2010), has all the page-turning qualities of its predecessor and will keep sports and mystery fiction readers in play all the way through. Some fans may miss the preponderance of gameplay action which makes Green's novels so riveting, but this one concentrates a bit more on character-driven action which has its own appeal to maturing readers. As a writer of hard-hitting sports fiction, Tim Green proves that, like his young hero Josh LeBlanc, he's still very much in the game.